Many things do not work in legacy video conferencing. In previous years, the costs of computing for encoding and decoding in video conferencing were high. Hence, groups of people gathered in a room to share a video conferencing system. They sat around a conference table with a video camera and a screen and were connected to a similarly equipped remote conference room. The room system camera was typically set to capture everyone in the room and the meeting participants in the same room frequently faced each other instead of the camera and receiving display, leaving remote participants feeling disconnected from the conversation. For reliable transmission in such legacy systems, expensive dedicated networks or quality of service enhanced bandwidth has to be used. However, telepresence systems are very expensive, require dedicated lines and most of all, you cannot take them with you when you travel. At the current price points for these systems, even the largest organizations will not be able to achieve universal access throughout the organization. The video switches that replace the MCU rely upon expensive, nearly lossless, networks to provide the quality and reliability users demand. 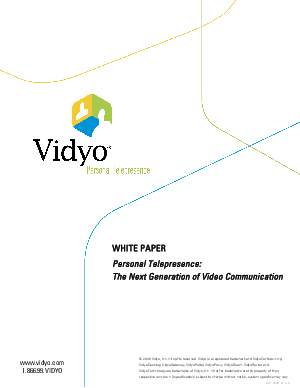 The fixed location of the endpoints requires a participant to travel to the specific destination to participate The solution is Vidyo Personal Telepresence. Personal Telepresence VidyoRouter™ based systems combine the quality of telepresence with the convenience and universal access of web conferencing, providing high quality, low latency communication over general purpose IP networks, like the Internet, at price points that make it possible to deploy to every desktop in an organization.